The Monmouth County Health Department (MCHD) will begin its weekly beach water quality sampling program the week of May 14. Forty-seven guarded beaches in the County's coastal region will be monitored for Enterococcus bacteria to assure safe bathing in coastal waters. Bathing water is also monitored for other potential hazards, such as medical waste and algae blooms, to assure public safety. The MCHD collected over 1000 water samples in 2017. Sample results can be found at www.njbeaches.org. Once again, it is the time of year to Fight the Bite! There are two different, but equally important, steps to help you from getting bitten by mosquitoes. 1. Eliminate any standing water on your property. All mosquitoes use standing water to develop from the egg stage to the adult stage. Read the list of potential habitats for mosquito larvae. 2. Use insect repellants when you are outdoors. Whenever outdoors, use a mosquito repellent on exposed skin having one of the following active ingredients: picaridin, DEET, IR-3535, or oil of lemon eucalyptus. Always follow product label directions. 3. If you have a mosquito problem, submit a request for service to the County's Mosquito Control at 732-542-3639 or online. For the first time since 2009, New Jersey has revised NJAC 8:26 the state code regulating public swimming pools, wading pools, bathing beaches, spas and whirlpools, waterparks and spray parks. The changes will better protect the general public while at the beach or pool. Some of the changes include the requirement that an Automated Electronic Defibrillator (AED) be provided on site. Public bathrooms are required in or within 100 feet of the facility or portable rest rooms must be provided. Additional changes in the code include a slight change in the wording of the required signage. Throw ropes capable of reaching from poolside to poolside are now required equipment. Reach/assist poles may not be telescoping and plastic rescue hooks that snap on are no longer acceptable. Add Your Septic Tank to Your Spring Cleaning List! As a homeowner you are responsible for maintaining your septic system. Maintaining your septic system protects your investment in your home. Unlike those who live in areas served by regional sewerage systems, septic system owners are unique because they are solely responsible for the daily operation and maintenance of their wastewater treatment and disposal system. By adhering to simple guidelines, septic system owners can ensure years of trouble-free operation with minimal maintenance. Homeowners of properties served by individual subsurface sewage systems (AKA septic systems) have some responsibilities that that those who are connected to a public sewer do not! The New Jersey Department of Environmental Protection has created a Homeowners Guide that every homeowner using a septic system should read and follow. Some key highlights from the Guide are included below for a quick reference. The entire Guide can be found at: http://www.nj.gov/dep/dwq/pdf/septicmn.pdf. Additionally, Health Department Inspectors are always available to answer any questions homeowners may have regarding proper care and maintenance of their septic systems. Inspect and pump your system every three years. Don’t dispose of non-biodegradable items or household hazardous wastes in sinks or toilets. DO: Check with the local regulatory agency or inspector/pumper before installing a garbage disposal unit to make sure your septic system can handle additional waste. DO: Check with your local health department before using additives. Additives do not eliminate the need for periodic pumping and can be harmful to the system. DO: Use water efficiently to avoid overloading the septic system. Be sure to repair leaky faucets or toilets. Use high-efficiency fixtures. DO: Plant only grass over and near your septic system. Roots from nearby trees or shrubs might clog and damage the drainfield. DO: Use commercial bathroom cleaner and laundry detergents in moderation. Many people prefer to clean their toilets, sinks, showers and tubs with a mild detergent or baking soda. DO: Keep records of repairs, pumpings, inspections, permits issued and other system maintenance activities, so there is a record to help troubleshooting problems as well as for having a record for a future home sale. DO: Learn the location of your septic system. Keep a sketch of it with your maintenance record for service visits. DO: Have your septic system inspected at least every three years and pumped periodically (generally every three to five years) by a licensed inspector/contractor. DON’T: Put dental floss, feminine hygiene products, condoms, diapers, cotton swabs, cigarette butts, coffee grounds, cat litter, paper towels, latex paint, pesticides or other hazardous chemicals into your system. DON”T: Use caustic drain openers for a clogged drain. Instead, use boiling water or a drain snake to open clogs. DON”T: Drive or park vehicles on any part of your septic system. Doing so can compact the soil in your drainfield or damage the pipes, tank or other septic system components. Congratulations to Matthew Wysokinski on receiving the Registered Health Environmental Specialist of the Year Award. The award recognizes Matt’s dedication and the major role he plays in the field of public and environmental health. 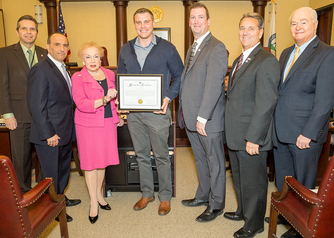 The Monmouth County Board of Chosen Freeholders recognized Matthew at their March 19th Board meeting. Through a cooperative effort by MCHD and the NY/NJ Baykeeper Organization, the Royal Flush pump out boat will return for the 2018 boating season. It's mission is to prevent the potential discharge of raw sewage into Monmouth County waterways. The Baykeeper will provide captains to operate the Royal Flush and the MCHD will administer the program and maintain the boat in operational condition. The service is available to all recreational boaters, and is not limited to Monmouth County residents. In 2017, the Royal Flush serviced 826 boats and removed 28,260 gallons of sewage. More information on the program and useful information for recreational boaters is available on the Royal Flush webpage. Saturday NEPTUNE TOWNSHIP 9 - 11 a.m. The MCHD conducted over 310 Recreational Bathing Facility inspections in 2017, including pools, spas, splash parks, ocean bathing beaches and a waterpark. The next meeting will be held on Tuesday, May 15, 2018. If you would like to review previous meeting minutes, click here.